Barber Park is located about 6 miles from downtown on Eckert Road between Warm Springs and Boise Avenues. Barber Park is open all year round, however, it is best known as the starting point for many Boise River rafters and tubers during the summer months. The park includes the Education and Event Center facility, covered patio for picnics, picnic tables and BBQ’s’ throughout the park, playground equipment, and numerous pathways and trails through natural wildlife habitat areas. Boise River adventure seekers will find raft and tubes for rent and free air stations for filling your own equipment during the summer months. Mid-November through mid-March wintering bald eagles can be seen perched in large Cottonwood trees watching the river for fish. Deer are also spotted roaming the park in the fall and early spring. Glass containers are prohibited in the park and on the river. Every year over 125,000 people enjoy a leisurely float down the Boise River, floaters put in at Barber Park and take out at Ann Morrison Park. People rent equipment at Barber Park or bring it from home and air it up at Barber Park. The park has air stations, a raft, and tube rental and a shuttle bus service. The float takes approximately 2-3 hours (about 6 miles). 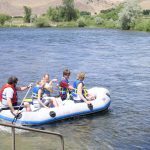 Raft and Tube Rental Information, or call 208-577-4588 (to speak with someone) or 208-577-4584 (Information line). 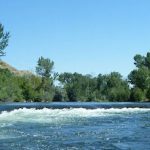 I’ve Never Floated The Boise River – What Do I Do? People rent equipment at Barber Park or bring it from home and air it up at Barber Park. The park has air stations, a raft and tube rental and a shuttle bus service. The float takes approximately 1 1/2 hours (about 6 miles). Stay Safe on the River! Make sure everybody in your party can swim. Alcohol, drugs and the river don’t mix. Wear a Personal Flotation Device as they are included in your raft rental and are available upon request. State Law requires that all vessels, including rafts, kayaks, and canoes be equipped with a personal flotation device for each person in the craft and children 14 years of age and younger, onboard vessels 19′ or less, must wear an approved life jacket when the vessel is underway. “Vessel” means every description of watercraft used or capable of being used as a means of transportation on water. “Vessel” does not mean non-motorized devices not designed or modified to be used as a means of transportation on the water, such as inflatable air mattresses, single inner tubes, and beach and water toys. 01. Vessels Thirty-Nine and Four-Tenths Feet and Over. A vessel of thirty-nine and four-tenths (39.4) feet or more in length shall be provided with a whistle or horn capable of making the prescribed signals provided for by 33 U.S.C. Section 2001 et seq., and a bell. The whistle or horn shall be audible for at least one-half (1/2) nautical mile, and the bell, when struck, shall produce a clear bell-like tone of full sound characteristic. 02. Vessels Under Thirty-Nine and Four-Tenths Feet. A vessel of less than thirty-nine and four-tenths (39.4) feet in length shall be provided with a whistle or horn capable of making the prescribed signals provided for and by 33 U.S.C. Section 2001 et seq. The whistle or horn shall be audible for at least one-half (1/2) nautical mile. Do not take infants or small children (under 50 lbs.) on the river. Make sure friends or family know when you’re going on and getting off the river. Wear appropriate clothes and covered shoes to protect your feet. If you get cold, simply get off the water. Be aware of your surroundings and identify your location on the river by a landmark – allowing a Rescue unit to provide assistance faster. If you fall into the water, stay calm, keep your feet point downstream, use your arms to ferry you across the water away from hazards, use your feet to push you away from rocks and other obstacles, and let your personal flotation device work for you. Leave the river cleaner than you found it. Do not take glass containers on the river or in the parks. Parking Kiosk Hours: 10:00 a.m. to 7:30 p.m. Monday to Friday. Saturday, Sunday and Holidays 9:30 a.m. to 7:30 p.m. When returning to the park after your float please use the drop off area as you will not be allowed to re-enter the parking area without paying the fee again. Kiosk gate into fee parking area is locked at 7:30 p.m.
Exit gate out of fee parking area available until sunset. Main Entrance Gate into Barber Park is locked at sunset. Main exit gate will be accessible to retrieve your vehicle. Remember to be kind to the neighbors and park in designated areas. Parking illegally could result in your car being towed or ticketed. Air Stations are available during the float season from 10 a.m. to 7:30 p.m. The float season typically runs from mid June to Labor day weekend. The air will remain on until the second week of September. Air hoses will be located on the building at the launch site. Seasonal Ground Worker – positions available, April through September. Parking Booth Cashier – positions available for up to 12 weeks. NOTE: You will be required to work weekends and holidays. Floating season runs mid-June through Labor Day, seven days a week. Weather and/or water conditions could affect opening and closing dates.